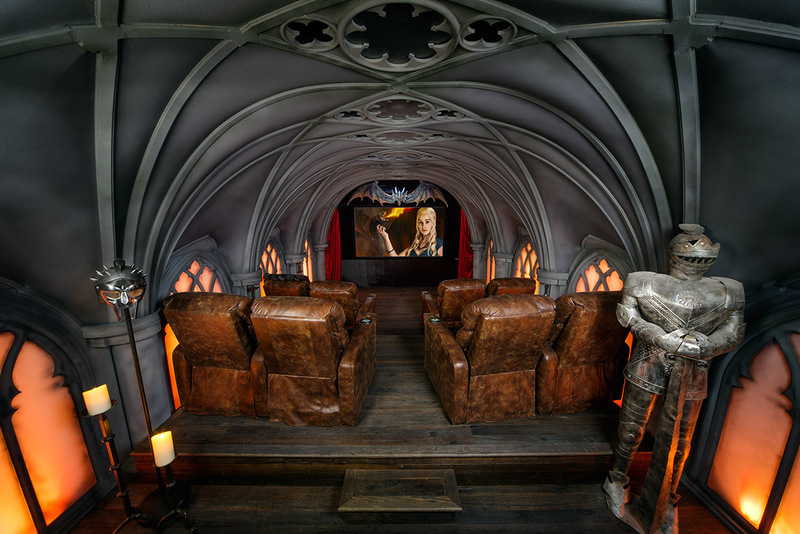 The 'Game of Thrones' TV show is brought to life in this custom home theater from Visual Concepts and Donny Hackett Design. This 'Game of Thrones' themed theater features a Wolf DLD-280FD projector, and a full 7.2 Pro Audio Technology surround system. You have your Game of Thrones fans who watch the show religiously. Then there are the super fans who want to be transported directly into the world of Westeros -- to be completely consumed by the atmosphere -- every sound, every visual, and every emotion. Jacob Abbott, president of Visual Concepts in Nashville, Tenn., knows one of these Game of Thrones super fans very well. The fan wanted a Thrones- and Spartacus-themed theater and Abbott gave him just that. “Listening and truly getting to know your customer is incredibly important when designing custom home theaters." The customer wasn’t just looking for great sound, he was looking for the clearest, most powerful sound system available -- sound that would completely blow him and his guests away when fire-breathing dragons roared overhead, or thousands of horse-mounted warriors clashed on the battlefield. Abbott and the rest of the team at Visual Concepts were up for the challenge. “Listening and truly getting to know your customer is incredibly important when designing custom home theaters,” says Abbott. 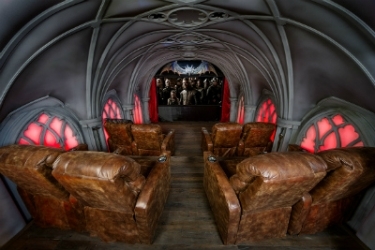 Visual Concepts worked with Donny Hackett Design to design and retrofit the room, with very few directives from the client except for this: The theater was to be a detailed replication of a scene from Spartacus or Game of Thrones. Visual Concepts specified a 7.2 Pro Audio Technology system because quite simply, no other audio manufacturer had product specifications that met the customer’s high expectations. After reviewing the efficiency, power and output capability of the proposed system, the customer was one-hundred percent sold on the PRO system. And, as an added bonus, the system came in under budget! "...We considered every detail of the room from complete reconstruction of the stairwell, ceilings and walls, to rich fabrics, plush furniture, specialized lighting, and even theme-specific automation features." For video, Visual Concepts was able to get their hands on one of the first 4K Wolf DLD-280FD laser DLP projectors in the industry with ProScaler MK III, along with a Seymour A/V screen and Helix media server. The entire A/V rack, including four Pro Audio Technology PMA amplifiers and Marantz pre-amp is hidden behind a seven-foot tall motorized door that can only be unlocked by lifting the end of a customized skeleton key installed on a nearby shelf. The theater is situated above a garage and needed a significant amount of soundproofing, so Visual Concepts used Dynamat to get the job done. Together with Donny Hackett Design, they also completely rebuilt the stairwell and motorized lift-gate entrance. After a significant amount of concrete work, the staircase was transformed into a spiral staircase resembling that of a castle. At the top of the winding stairs, visitors are greeted by a wooden arched double-door entrance. To the left of the entrance is a custom-made bar atop whiskey barrels, antiqued to give it an authentic look. The dramatic vaulted starlit ceilings and side panels of the theater also feature back-lit DMX RGB lighting that, much like all of the automation, can be controlled via iPad through the Control4 system. Taking the automation experience to the next level, Visual Concepts incorporated the customer’s sword collection into six individual motorized columns throughout the room -- each lit from within and timed so that when switched on, one-by-one the columns rotate and light up to reveal the sword within. Abbott’s team also included a coffee table with a CNC-machined, back-lit map of the Game of Thrones world. Knocking three times on the coffee table unlocks and opens it to reveal the customer’s hidden gaming consoles. Donny Hackett Design built wings for the customer-supplied dragon head, which are mounted on the wall directly above the projector screen with eyes lit by pin lights mounted on the projector for visual effects, while a full suit of armor cleverly named ‘Sir Duncan the Tall’ stands on guard at the rear of the theater. The entire project design, construction, installation, and automation took over six months with dozens of hands on deck. From the very first step of the stairwell, the Spartacus and Game of Thrones theme is apparent. Visitors are immediately transported through time, as they walk below the lift gate and up the candle lit cement castle stairs, complete with back-lit varnished rope hand rail, to the otherworldly theater above. “Our client was extremely specific right down to the most minute details, but as the popular Game of Thrones saying goes, ‘The man who passes the sentence should swing the sword’, and that we did,” says Abbott. To see the home theater in detail, check out the slideshow! Erin Phillips is an account manager for Caster Communications.